Mining operators across the world produce billions of dollars worth of precious metals and gems every year. Undoubtedly, security and revenue protection is a major issue for the producers. X-ray security systems have been available for many years, but with the technology development and higher detection rates, producers are now ready to offer more sophisticated solutions than ever before. These range from conventional bag scanners to state-of-the-art X-ray body scanners and vehicle inspection systems. Each one of the product groups has its own application within the mining sector, but all of the screening solutions are directed at preventing theft, tackling the issue of contraband and strengthening security of the industrial facility. However, improvement of checkpoint efficiency in line with strengthening the security of a mining facility is something which needs to be additionally considered and evaluated by end users. 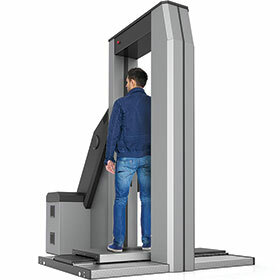 Using the Adani Conpass full body scanner is something that can tackle both abovementioned issues. The product is able to detect concealed contraband, ranging from diamonds to narcotics, on or inside the body of any individual in less than seven seconds. This functionality offers security managers the most comprehensive and, at the same time, most efficient personnel inspection system which can both improve inspection efficiency and also provide the most comprehensive searching capability. Most manufacturers within the industry focus on developing ‘off-the-shelf’ products and selling those without making them flexible enough to perfectly fit into the end user operations. Adani believes that the customer must always obtain a solution to solve a particular problem, rather than obtaining a device which addresses only part of the issue and will not fully become part of the security operational system. The company’s strong focus on product development, as well as the company’s capability to develop fully customised devices, allows for the solutions to be well integrated into the access control systems, local data sharing networks and any other types of data gathering devices, ranging from barcode readers to iris scanners. This adds extra value for customers as it allows for them to ensure that the X-ray screening device is used as part of the fully integrated security system and operational efficiency is not negatively impacted. The benefits of integrating X-ray solutions into the security operational processes within the mining sector range from ensuring that mines are free from narcotics and weapons, to eliminating theft within facilities that extract and process precious metals and gems. Adani recently launched a new improved Conpass DV (Dual View) solution which is able to detect diamonds as small as one carat hidden on an individual’s body is aimed at the mining and mineral processing market segments. The product arguably provides the best X-ray imaging capability at the lowest radiation dose of any system available on the market. Application of this technology within the mining sector can eliminate the issue of industrial theft within mining facilities and strengthen security. When adopting X-ray solutions as part of a company’s security measure, one of the main considerations is to make sure the device can function well within the current operational system of a mine. Particular issues include software integration and redesign of the operational process in order to ensure that efficiency is not affected by introducing the product whether it is a bag, body or a cargo screening system.